Warning: May Contain High Amounts of Classic Ska and Britpop. We have returned home, albeit about six hours later than expected, due to missing our connecting flight, the illogical checking through US Customs while in Toronto, and an incredibly frustrating and nonsensical argument at one of the help desks. But I won’t go into that. I will mention, however, that we finally got back to the apartment at 1am PT this morning (after waking in London at around 7:30am UTC), so that means we’d been up and awake for…um…20 hours? Maybe? Either way, we both decided to stay awake instead of attempting to sleep for six or so hours. So yeah…not quite loopy (yet), but my inner clock has no idea what time or day it is right now. That said… As you can see above, our London trip was a success on many levels…many sights seen, a few great friends met up with, many beers and pub food had, and way too many pictures taken. The above cd stash is courtesy of Sister Ray in Soho and Rough Trade in Notting Hill, two great music stores well worth searching out. Sister Ray is probably my favorite — it’s not huge, but it’s got an excellent selection, very well kept, and the workers there are quite friendly and knowledgeable. My main goal for import shopping, as is evident, was cheaply-priced reissues. 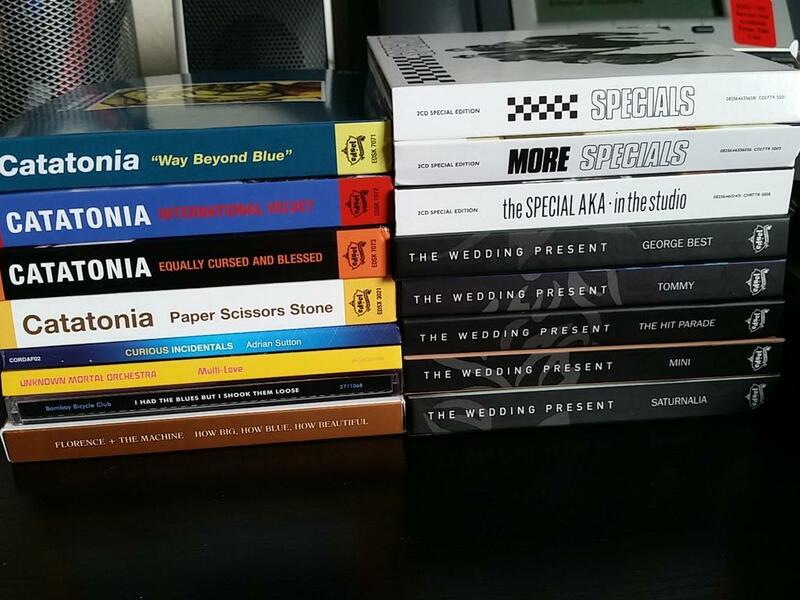 I believe the average price for the Catatonia and Specials cds were £12, and the Wedding Present cds were slightly more — translating to about $18 and $20 USD each. Not bad, considering they’re all two or three cd sets costing about six dollars more before tax on Amazon. I’m still missing 3 Weddoes titles, but I think I can find those relatively easily on Amazon UK. Still — it added up rather quickly, so I may have to tighten my belt for a little while! As you’ve probably figured out (or remembered from last year’s LJ missive), I’ve decided to give Record Store Day a pass from here on in, as it’s pretty much become the antithesis of what I feel about record stores. I bring this up because it’s about that time of year, and the online music blogs are starting to talk about it again. Back in the late 00’s, RSD was conceived as a way to celebrate the then-struggling record industry, a day for everyone to head over to their local shop, peruse the aisles and come home with some nifty deals and some sweet music. I was on board for that, considering my own spending habits. [Hell, just recently I was going through some old bank paperwork and found my checkbook register from 2003-4 — the number of times I hit Newbury Comics during that time was astounding.] You can still find my 2008 comment in the Public Quotes section of the website (I’m the third quote down here). Nowadays, I feel this celebration is less about remembering how cool record stores are, and more about that really cool collector’s edition 7″ (only 1000 printed!) of songs I have already but DUDE IT’S RED VINYL. Really, I’m not kidding — check out the ‘special releases’ for this year. And that’s just the US listing…other participating countries have even more, sometimes bigger lists. Not to mention that it’s no secret that many of these end up on eBay at inflated prices before the sun goes down. Now, I really hate to be cynical about this, I really do. But last year when I went over to Amoeba to enjoy perusing the bins like I always do, I realized there was no way in hell I’d be able to do so. The reason was that many of the outer aisles were blocked by an insanely long line of about four hundred people, arms full to bursting with the same collector’s edition purchases and not a single item from the bins. Others not in line were blocking the inner aisles, chatting away and comparing collector’s edition finds and other rarities they’d found over the years. I gave it about twenty minutes before I walked out of the store, pissed off and emptyhanded. I never do that. Not at a record store. I’ll at least have one or two items in hand when I leave. SO. I submit this: Any day can be Record Store Day if you want it. Heading to the local shop shouldn’t just be about getting the collector’s edition…not that I’m dismissing those, but I’m of the mind that music shopping isn’t just about getting that rare item. It’s about finding that cd in the dollar bin that you’d completely forgotten about for a decade or so, with all the memories of that release flooding back to you from out of nowhere. It’s about seeing what’s hot and what’s not. It’s about putting those beat-up headphones over your ears to sample a few songs before you buy. It’s about finding a nifty present for your sister or your husband or your mom or whoever. It’s even about buying that tee-shirt of that band you’ve just fallen in love with. And you can do that any time. Hell, even if you don’t have a local record store you can get to (which, in all honesty needs to be rectified STAT! ), head to the band’s or the label’s website and order the cd direct. Donate to a PledgeMusic or a Kickstarter or a Patreon event, watch the band in the process of recording that album, and get a copy in your hands when it’s all done. Check out some of the great no-label indie releases on BandCamp. There’s a shitload of great sounds out there, if you’re willing to search for them. Because really–it’s about the bands, when you get down to it. The record store is where they sell their wares. It’s where you’ll find what you want and need. And you can do that any day of the week. I was doing really great with my writing schedule over the last three weeks. So what happened? Why did I miss a music blog yesterday? Well, simple: it was my birthday. I’m now the grand old age of 44. In New Englandese, I’m an old faht. A. said her present to me is letting me spend even more money at Amoeba today with no strings or guilt trip attached. Heh. We spent most of the day going to a restaurant on Divisadero called Brenda’s Meat & Three, where I had a ridiculously large breakfast po-boy with a side of cheddar grits. We drove over to the Mission where we hung out at ImagiKnit, Borderlands and Dog Eared Books, and took pictures of the local scenery. On the way back we stopped at the Bi-Rite on Divisadero for my cake (after a brief one-block walk up Hayes to Alamo Square, where, after 9 years of living in the city, we finally saw the famous Painted Ladies houses). And ended the day watching nine consecutive episodes of Azumanga Daioh and having sushi for dinner. And cake, of course. Anyhoo! This means that I don’t have too much have to say musically today. At least not at the moment, as I am being the Biggest Slacker in Town, considering I so rarely take personal days off. I didn’t even shower until after 8am! The shock and horror! Well…all this is due to the fact that Amoeba doesn’t open until 11am, so I have a bit of time to kill. I have a few more cds and dvds I can gather to sell to the store so I can get credit. And A. is supplying me with WetNaps, as I will likely be spending most of my time in the dirty and dusty dollar bins. Once I return I will report on my purchases and any other silliness that goes on in the Haight. See you on the flipside, kids! This past weekend A. and I headed over to the Haight to stop at Amoeba Records. Her motive for going there has been to search for older Doctor Who serials and other BBC television series, while mine (as always) has been to scour the bins for music. This time out I was looking for albums by Sinéad O’Connor and Saint Etienne to bulk up my collection, and I knew I’d find both in the dusty dollar bins hidden way in the back western quadrant of the giant store. I wasn’t let down, either–I found three of O’Connor’s albums I needed (a fourth was found used in her regular bin for $7), and I found a lot more Saint Etienne than expected (plus grabbed two further albums for $4 each in their regular bin). Further browsing in the store brought up a few more ‘why do I not have this yet?’ albums. All told, I must have spent about $30 on 14 cds, which is not bad at all. I have two days off surrounding my birthday in a few weeks. There’s a good chance I may head there for a second round. I’m a sucker for dollar bins, I’ll be the first to admit it. I don’t mind if the jewel case is scuffed up or slightly cracked, or if the cd is a bit worn–as long as it sounds good. It’s about the music for me. I’m well-versed in digging for gold in these bins, and I have no problem with spending a good two or three hours getting dirty and dusty doing it. Back in my nearly-broke days in early 90s Boston, I was a regular at Nuggets, Planet, In Your Ear and Looney Tunes, and back then my finds were all cassettes and albums. I could buy a dozen full length albums for less than twenty dollars. And in the late 90s and early 00s, I’d continue to make monthly runs to Boston to find sweet deals. My record collection was age-worn and scratchy, but it was also damned huge and well-rounded. Here’s the trick: the dollar bins are often full of albums that are at least ten to twenty years old, so if you’re in need of that classic album from 1993 that you never got around to buying, chances are it’s in there, the original versions given away now that their former owner ripped them to their computer or bought the remastered-with-extra-tracks editions. This was the same when I used to do the Boston runs: in the early 90s, I could easily build up my 70s classic rock collection; in the late 90s it was the 80s pop; in the 00s it was all the Britpop I was too broke to buy first time out. At this point I’m realizing things have come full circle, as I’m now finding all the albums from my tenure at HMV in the late 90s. I see titles I once owned either as promo copies or bought at a discount, but I also see many that I’d completely forgotten existed. On multiple occasions I’ve pulled out a cd and stared at it for a second, that memory connection suddenly refreshed and clear. And they’d get dropped into my basket. 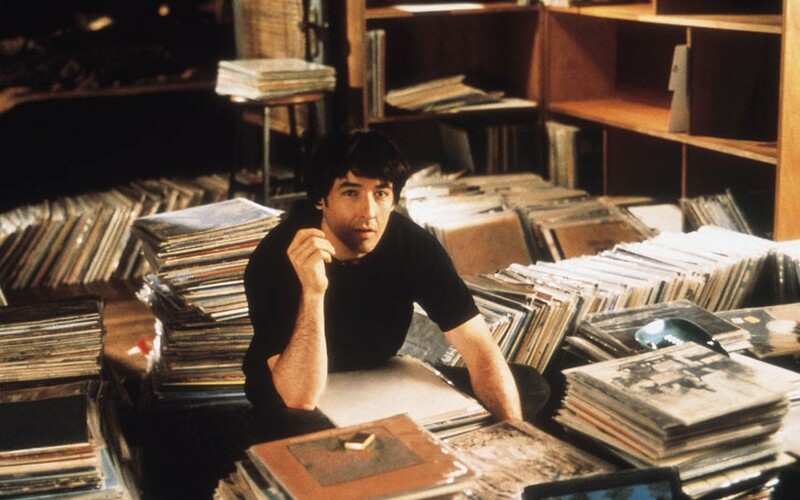 Yeah, I’m well aware that dollar bin diving is pretty much a lost art now, considering the current state of music downloading, streaming and sharing, but think of it this way–that copy of Boston that you used to have on vinyl and never got around to picking up on cd? You could either download it from Amazon or iTunes for the midline price it usually goes for (as of this writing it’s one of Amazon’s monthly $5 titles)…or you could buy the dollar bin copy for $1.99. If you’re a compulsive music collector like I am, this was, is, and shall always be one of your favorite sections in the store. So this April, when you’re heading to whatever shop for Record Store Day, spend a little more time than that ten minutes grabbing your RSD Collectible goodies and that hour waiting in line to pay for them. Spend more time in the regular bins, reacquainting yourself with your favorite bands and others you’ve never quite gotten around to listening to. And spend a good three or four hours in those dusty dollar bins (and provide your own Wet-Naps). You’ll be surprised what you might find.